This is the third post in our series on handwritten letters. Read the first post here, and the second here. Composing a letter takes time and thought. I try to tell my daughters of this when they go to write their birthday thank you notes, but it is much easier for them at this point to follow a template that I jot down for them. As an adult, I know that if I really want to convey my thoughts properly, I have to take time to compose and that sometimes means writing a draft! Wow. Ain't nobody got time for that, I know, but it can be worth it in the finished note. Especially if someone is going to keep it forever. I went through an extended illness and was fortunate to receive lots and lots of cards, letters, emails and messages. I have every single one of them. Some were simple good wishes signed to a lovely greeting card, but others were deep, encouraging missives that left imprints on my heart. The witty and fun blog Uncommon Courtesy talks about etiquette and advises on you may bend or break these rules in real life. They have a great writing voice and introduced me to these instructions from the New Letter Writer for Ladies, circa 1867. 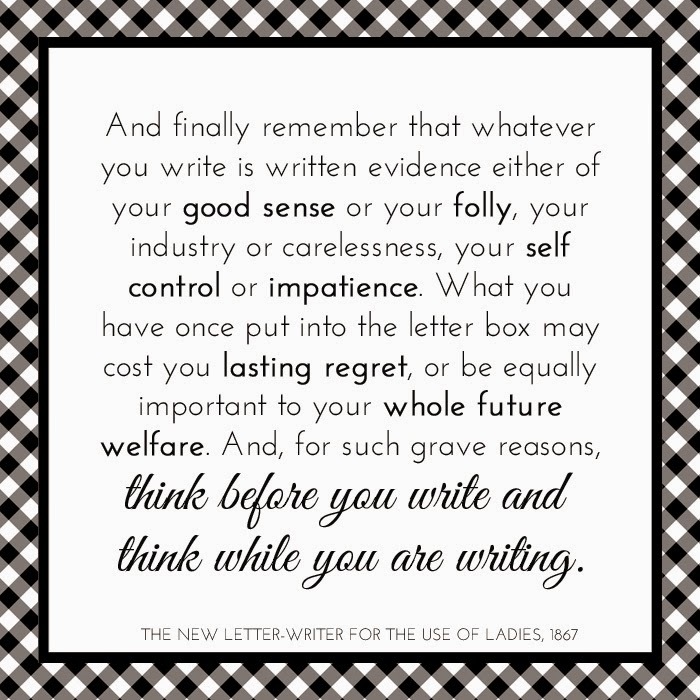 This advice is still important for the letter writer to keep in mind today. I love it. Kit believes in The Power of the Thank You Note and we do, too. Southern Living (of course) has a great article on How to Write a Thank You Note. Must read! Allison at Oh My Goodness Gracious knows about social graces and has Fool-Proof Thank You Note Formula for you. This article has great and easy ideas on helping your kids write notes. Lastly, we're so passionate on the subject that we've written two posts to help you craft the perfect note! This post is pointed toward professional thank you notes, and here we offered tips for writing notes with your children. How do you compose a note to a friend? What are your musts to include? Find monogrammed and stylish stationery for all your handwritten notes here and here.